It’s just after 1pm when I leave my sixth floor apartment in the Mexico City Historic Centre and walk a couple of blocks to Pulquería La Antigua Roma (Ancient Rome) on the corners of calles Allende and República de Perú. It’s an old school, no-nonsense place with plastic chairs in a square room with just four small tables. The floor is still wet having been recently mopped, saloon style doors swing lightly. Today’s selection of curados (flavoured pulques) are fresa (strawberry), avena (oatmeal) and apio (celery). 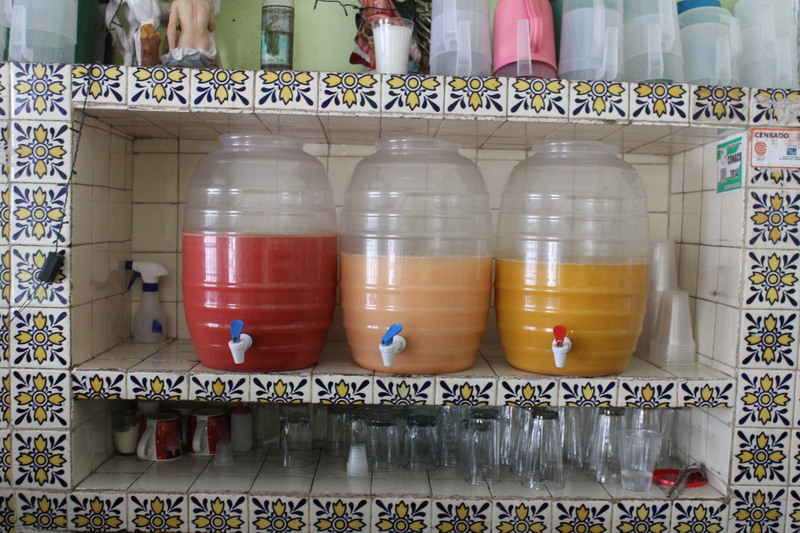 For many the flavour of natural pulque (the fermented sap of the maguey plant) is just too overbearing. It is certainly an acquired taste. Today I opt for avena (16.50 pesos MX) and sit down to my corner table. Shortly after, a young couple, seemingly grungy students, enter to get some take-away – a large empty plastic cola bottle is produced. 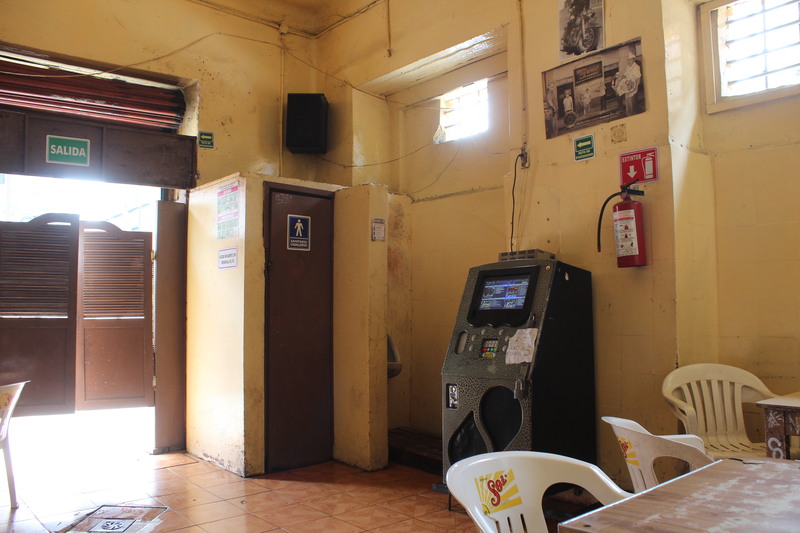 While it’s being filled with strawberry pulque, the guy makes use of the urinal tucked away in one corner of the small room but in full view, a relic of the days when pulquerías were strictly male only. 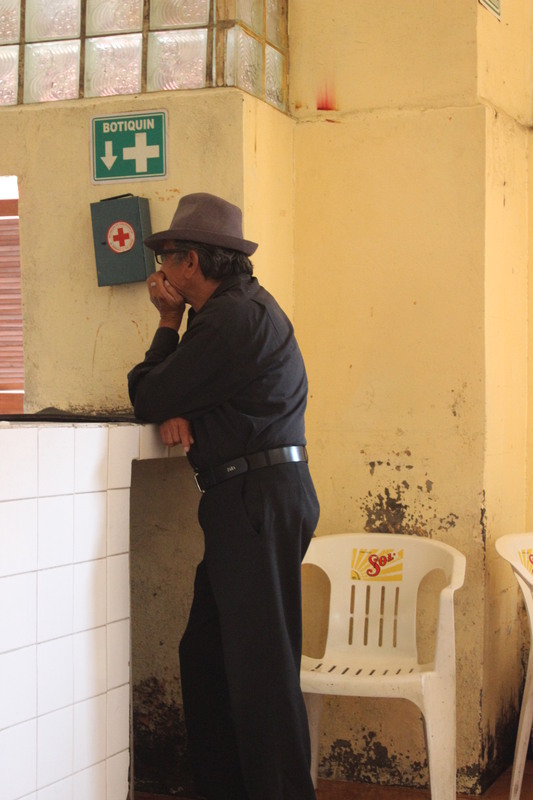 As the sole patron, I strike up a conversation with the attendant, a diminutive gent in his seventies, who tells me that the pulque arrives fresh daily from the nearby state of Tlaxcala. This very pulquería, I am informed, has been here for over 100 years, back to the days of the Mexican revolution and the attendant himself, over 35 years. Being oatmeal flavoured and being pulque – thick, viscous, like snot, slimy, phlegm of an ancient Aztec ruler – the experience is not dissimilar to porridge, gloppy and sweet with a sprinkling of cinnamon on top. A retro jukebox with a leopard skin finish blares for one song (it’s 5 pesos for 2), animated by the aforesaid attendant, before dying to silence. I decide to fire it up again, choosing cerebros enfermos (sick minds) by Los Buitres de Culiacan (The Vultures of Culiacan) and another track by Los Rieleros del Norte (The Railroad workers of the North). I return to my seat, raise my glass and lean back to enjoy the music. An altar to the virgin of Guadelupe adorns one wall and its flowers are tended to by the attendant who pours fresh water into their vases. I finish my pulque, rise, give my thanks and exit to the outside world. From La Antigua Roma, it’s only a couple of minutes walk to Plaza Garibaldi – Mexico City’s famous home of mariachis where people arrive to be serenaded at all hours of the day and night to celebrate birthdays, anniversaries, engagements, life itself. 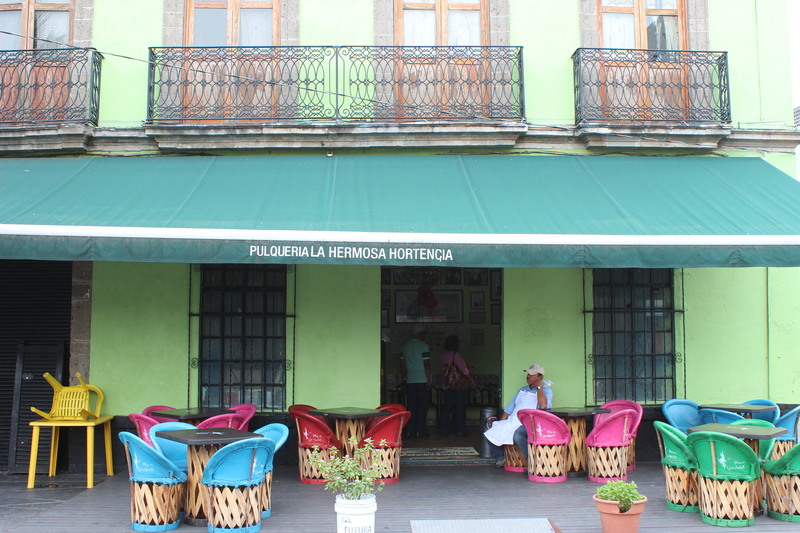 La Hermosa Hortensia (The Beautiful Hydrangea), founded in 1936, is situated on one corner of the square. 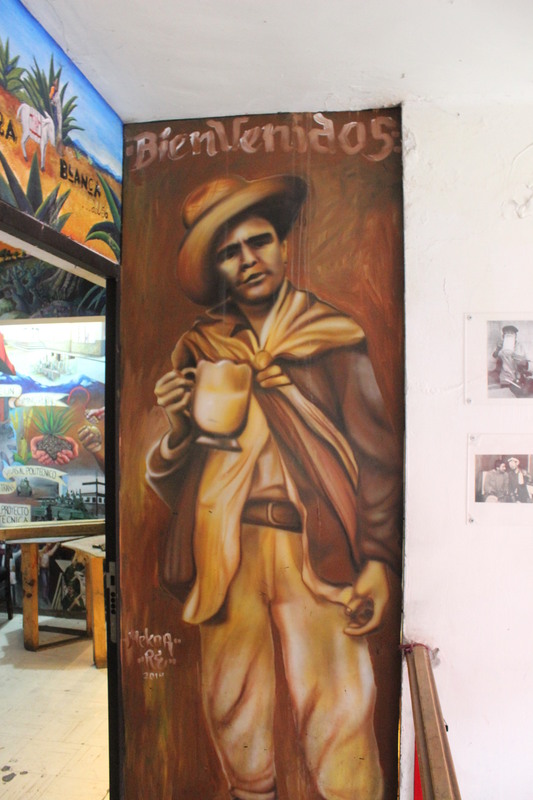 It is also a small space but far more elaborately adorned, with paintings of the agua miel (honey water) being extracted from the maguey plant, pulque being transported in barrels behind burdened burros, newspaper clippings of famous mariachis and photos of patrons from times long past. This time I sip on a durazno (peach) pulque (25 pesos MX) while three gents at a nearby table extol the virtues of the prehispanic tipple – it’s so healthy! I look out onto the square and beyond to the tallest building of the city’s historic centre, la torre latinoamericana. A lone mariachi strides by, his violin in a wooden case. The flavour is delicious, this time not dissimilar to the sweet syrup that accompanies canned peaches but thicker, more viscous. Another customer enquires about the effect that his glass of pulque will have on him – ‘no pasa nada!’ – is the immediate reply. ‘It’s just like a refresco, some people drink 3-4 litres.’ I finish mine and exit onto the concrete expanses of the mariachi inhabited square. I make my way across the centro histórico, past hordes gathered at the front of Palacio de Bellas Artes, through the lame one block Chinatown to Las Duelistas (The Duellists) on Calle Aranda, not far from la calle de los pollos (The street of the chickens) dominated by vendors of recently slain fowl. 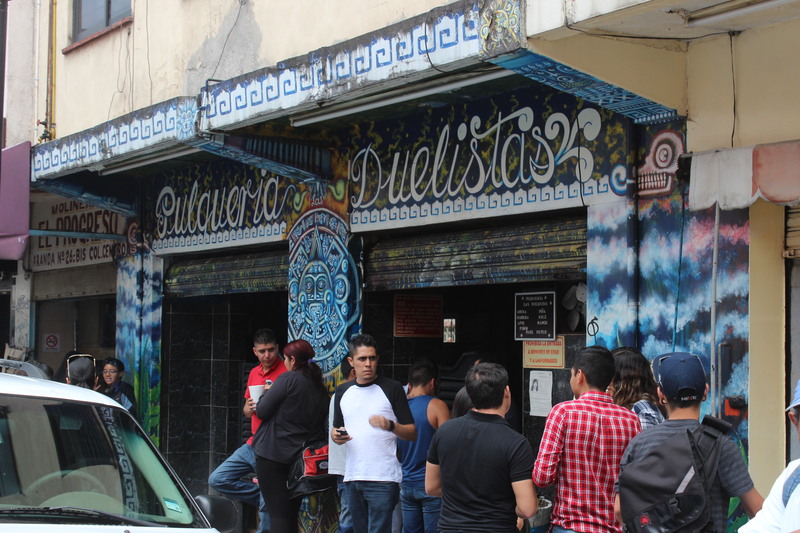 Las Duelistas is invariably packed to the rafters with young students, testament to the fact that after losing popularity, pulque is definitely back in. Vivid, psychedelic prehispanic murals swirl in adornment on the walls and ceiling adding a further element to your hazy pulque fuzz. It’s so packed I decide to venture on. 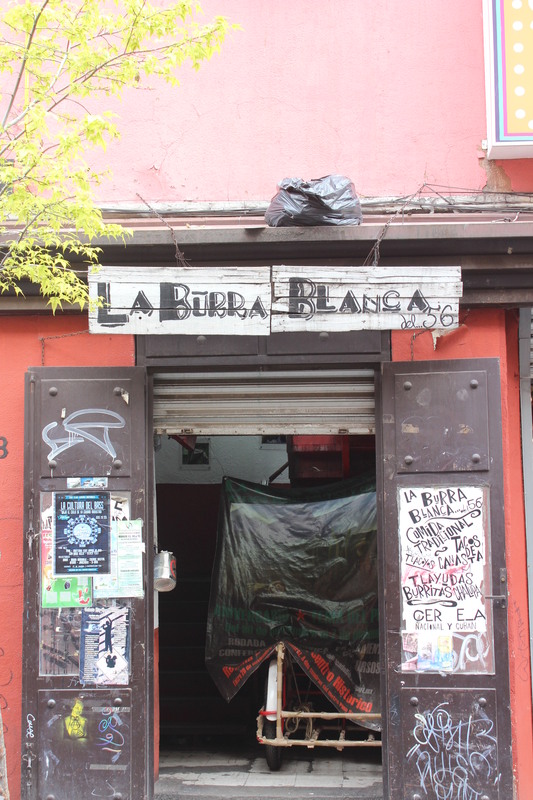 I head off to calle Regina and climb the stairs to the ardently leftist enclave that is La Burra Blanca (The White Donkey). Murals of revolutionary heroes Pancho Villa and Emiliano Zapata eyeball me as I raise the frothy ‘nectar of the gods’ to my lips. Here it is a manzana (apple) pulque (30 pesos MX – medium) that trickles down my throat. 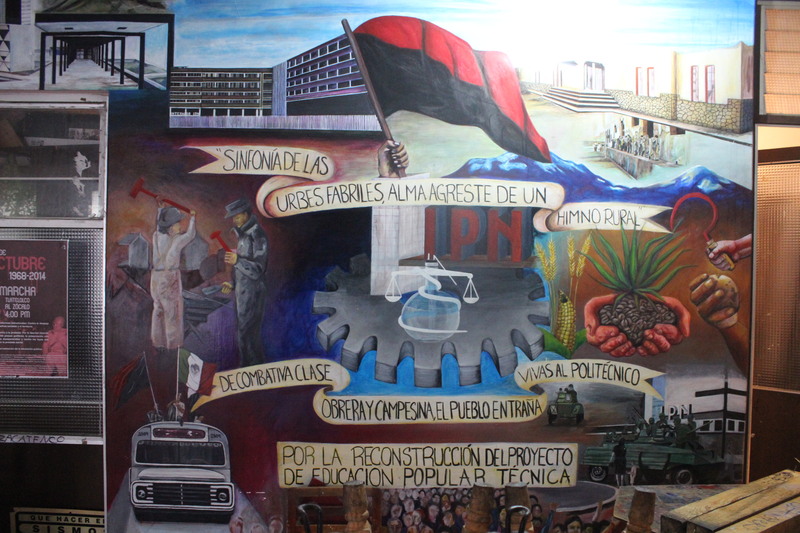 Surrounding me there is a makeshift memorial to the Ayotzinapa 43 and a banner in support of the students of the National Polytechnic Institute. I finish my mug and with a slight fuzz overtaking my being, I lean back in my chair, close my eyes and try to imagine the lives of the ancient Mexican indigenes, their culture, their rituals. A kaleidoscope of Mexican images flash through my mind, regurgitations of what I see all across this incredible city; cacti, stencils of colourful skulls, mangy stray dogs, pyramids, roaming vendors everywhere, quesadilla griddles tended by ancient hunched señoras, slanted colonial buildings, organ grinders..my mind wanders on. A man selling three peso cigarettes snaps me back to the current reality. I order a refill, take another gulp and look around at my fellow imbibers with a smile on my face. In no other country on earth can I do this. 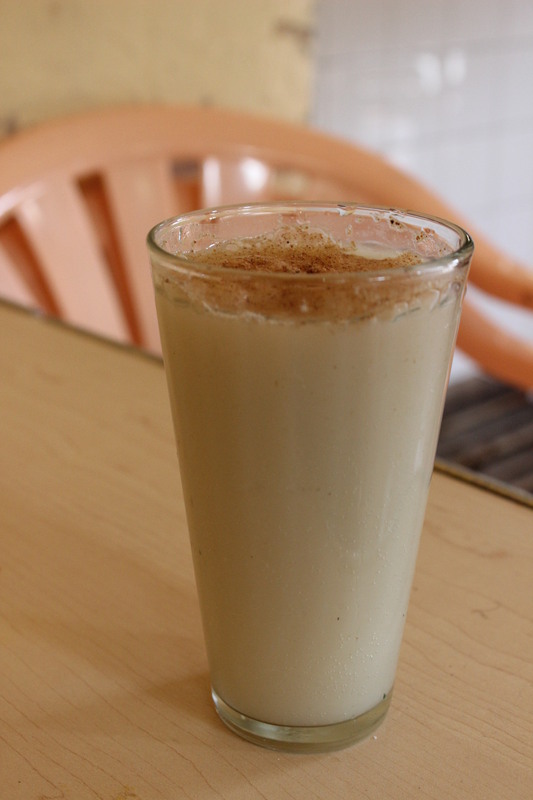 Pulque: it’s prehispanic Mexico….in a glass. Peter. Once again those are great pics and your observations are fascinating. Every time I read something by you I get home-sick!! PS I see that you were moving from the cheaper end (16.5 pros) to the more expensive (30 pesos a serve). Can you notice the difference? Hi Barry, I think the increase in price probably reflects the pulquerías themselves rather than the quality of the pulque, although not being a noted pulque connoisseur I couldn’t guarantee that . 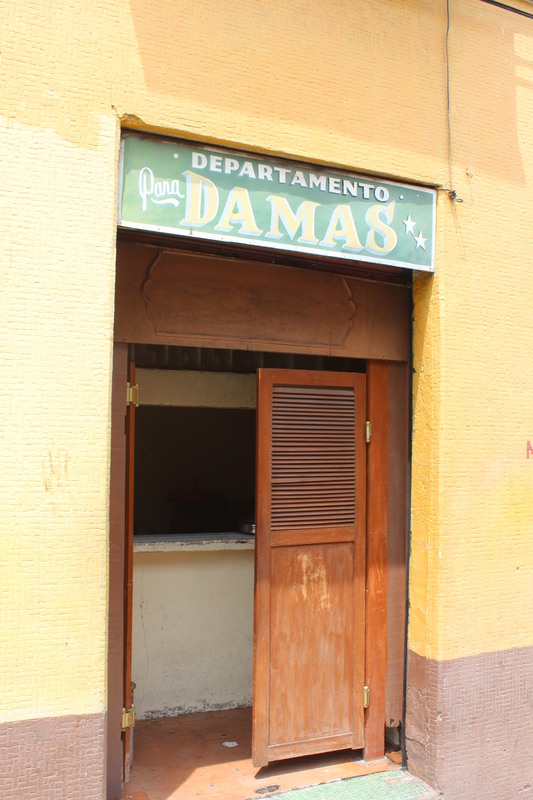 The glory days of La Antigua Roma are behind it, I would say and it is in a run down part of the centro histórico. La Hortensia Hermosa is on Garibaldi so I guess their rents are higher and there is obviously more of a party and tourist vibe with inflated prices to match. As far as La Burra Blanca goes, the pulque I had there (medium sized) was in a mug and somewhat larger so I guess that accounts for the higher price. Thanks for the comment. You’ll have to get back over here soon! I really like pulque, even the natural flavor, although I agree that it was a bit “odd” upon first sampling. 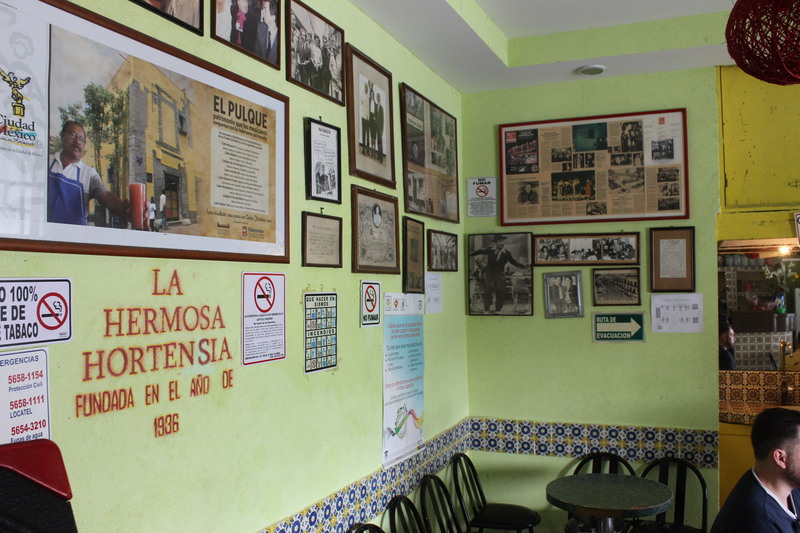 I’ve been to La Hortensia Hermosa in Garibaldi, and to another one in the Centro that is just off of Eje Central. It might have been Las Duelistas; I’m not sure except that it was lively and had some murals inside. An interesting side note is that most DF pulquerias close early b/c they are/were reputed to be centers of vice. Hey man, yeah I like the natural pulque too although it takes a bit more getting used to. I’ve been to lots more pulquerías to, I might have to have a sequel post. Salúd! !